I’m always on the lookout for a new, cheap (aka free), wireframing tool that can easily communicate ideas and workflows to development teams or clients. 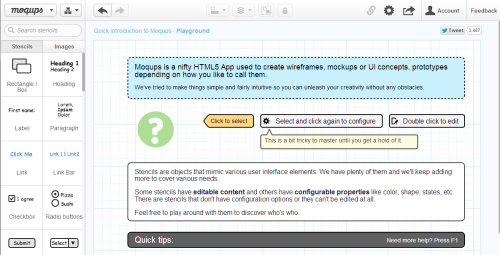 Today I stumbled upon Moqups, which claim to be “The most stunning HTML5 app for creating resolution-independent SVG mockups & wireframes for your next project.” Survey says: I dig it! The UI isn’t the most glamorous design I’ve ever seen, but more importantly the user interface is intuitive, simple and easy to use and at the end of the day, that’s all I’m asking for. I don’t want to spend hours wireframing ideas that are going to get tossed away like my post-it notes. It also comes with standard templates for mobile and responsive web designs, plus it is a Chrome extension!